Raw Sushi Recipe - Rice-free, sugar-free, high protein, low carb! 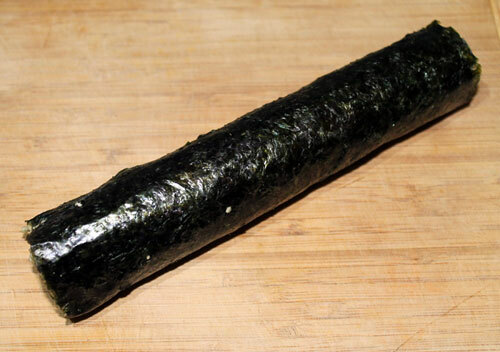 This raw vegan 'sushi' excludes fish and consists of rice-free nori rolls and wasabi paste. Sushi rice is usually sweet and has added sugar, and in this recipe the apples more than make up for the sweetness of it. The pumpkin seed paté makes this dish more hearty and protein-rich. Various vegetables are added for crunch and flavour, and the end result combines the flavours of sweet, salty and hot perfectly (apple, soya sauce, wasabi horseradish). This very healthy, protein-rich and starchy-carb-free dish will never get boring because there are so many different varieties that can be made, many of which are discussed below. 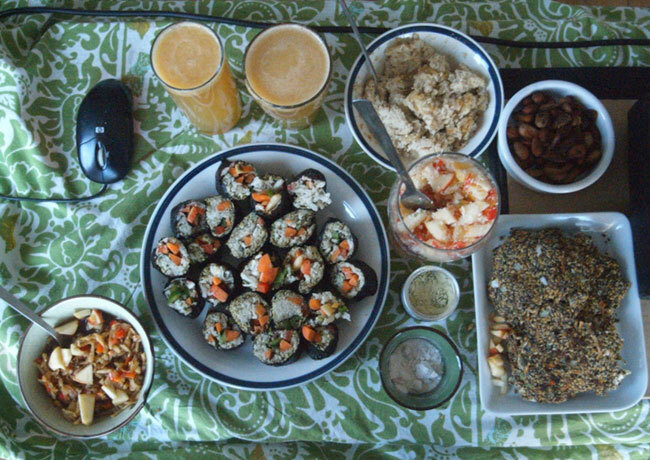 The day before making this dish: Soak cashew nuts for 4 hours in water, and the pumpkin seeds for 7 hours, and rinse both thoroughly afterwards. To make the sushi 'rice': Grate the apples, chop the cashew nuts fine and mix together with salt and pepper. Place the mixture in a fine sieve with weights on top to remove excess water. Puree all the paté ingredients in a food processor. Use a sushi mat or a clean kitchen towel to compile each sushi roll on. Lay out one sheet of nori, textured side up. Spread a thin layer of pumpkin seed paté onto the nori sheet, starting from the edge closest to you and covering 3/4 of the sheet. Lightly press the paté into the sheet. Spread apple 'rice' thinly over the pumpkin, covering about half the sheet. Place strips of vegetables of your choice (see substitutions below for ideas) on the nori sheet, along the edge closest to you. Have a small cup of water ready before rolling the sushi. Carefully roll the sushi, applying even pressure along the whole length. Use a little water along the furthest edge of the nori sheet to seal the roll edge to itself. Place the roll on a dry, clean chopping board, and carefully cut into slices using as sharp a knife as possible. Wipe the knife dry after each cut. Prepare wasabi paste by mixing wasabi powder and water: one part each. Serve the nori rolls with wasabi paste and (nama shoyu) soya sauce. If you wish to have raw salmon or tuna with your nori rolls, make sure you buy it from a (Japanese) shop which prepares it specifically for sushi, so that it is clean of contamination and safe to eat raw. It is best to place the vegetable strips along the edge closest to you, for ease of rolling. Raw sushi roll, ready for cutting and sealed with water along the open edge. I use toasted nori sheets because they taste nicer, even though they are not raw. Always store the nori sheets in the fridge, otherwise their taste will deteriorate. Rolling sushi is an art. 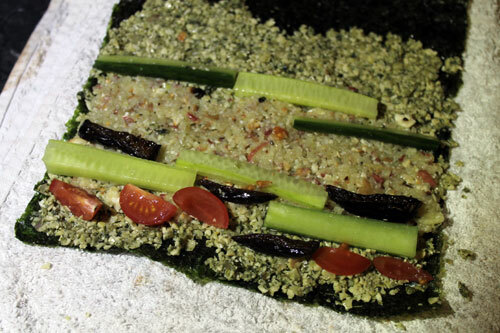 In this recipe you use the pumpkin seed paté to 'reinforce' or strengthen the nori sheet. Then you spread the apple 'rice' as thinly as possible over it. The strips of vegetables should be placed close to the edge towards you, which ends up in the middle of the roll when rolling. You may be able to carefully roll the sheet (if it's composed this way) without the help of a sushi mat or a kitchen towel but keep in mind that there are also many sushi-rolling tutorials online. Keep in mind when experimenting with different ingredients that at least some of the vegetables rolled into the roll should add color and crunchy texture to the dish. Note that the word 'sushi' really refers to the raw fish that is had with the nori rolls. However, I use the word sushi regularly to refer to the nori rolls, even though it's not strictly correct, so I thought it was appropriate to call this dish raw vegan sushi. Much of the raw-seeming fish served with sushi is actually heat-treated to make it safer to eat. Something to keep in mind if you have previously considered sushi raw food. In any case, I advice caution if contemplating eating truly raw fish in any form, for reasons of hygiene. The grated apples in the 'sushi rice' can be replaced with grated parsnip or celery root. They are not as sweet, which some people may prefer, and also they are easier to use since they are less soggy than grated apple. Apart from the 'rice' and pumpkin seed paté, other ingredients that can be used inside the roll are: carrots, avocado, fresh coriander (cilantro), fresh baby spinach leaves, dried plum, cucumber, bell pepper, celery, etc. You can also purchase pickled sushi ginger for serving with or prepare it by cooking thin slices of ginger in salt (1 teasp), sugar (1/4 cup), rice wine vinegar (1/4 cup) and water (1/4 cup). I find that the ginger is not necessary for this dish, however, and goes better if you have sushi fish as well. This recipe is based on the 'Nori Rolls' recipe in the Cafe Gratitude cookbook, which is a raw vegan chain of restaurants in California. The book is called 'I Am Grateful' and the original recipe is called 'I Am Enrolled'. My first raw food experience was at the Cafe Gratitude in Berkeley, California, and I was extremely surprised by the amazing flavours of the food they served, as well as how healthy everyone looked. This cookbook contains more 'gourmet'-type raw food recipes, which require a little more time and effort than your average raw food dishes.